Across their range in South America, the iconic pink river dolphin faces an increasingly uncertain future. Water pollution, dam construction, poaching and bycatch pose serious threats to these amazing creatures, which play a critical role in rivers they inhabit. “River dolphins are like jaguars in the forest. As top predators, their population status is an indicator of the health of the rivers and ecosystems they inhabit. 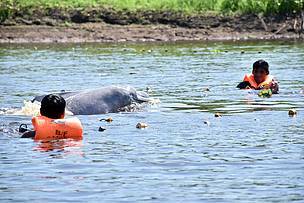 If the dolphins are doing well, all the other local species will also thrive,” said Biologist Jose Luis Mena, WWF Peru’s Science Director. 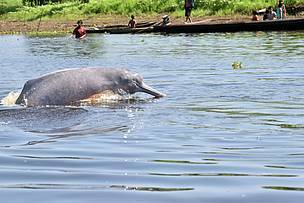 "But tackling the main threats to river dolphins in Peru is made even more difficult by a lack of data about their population status and behaviour." 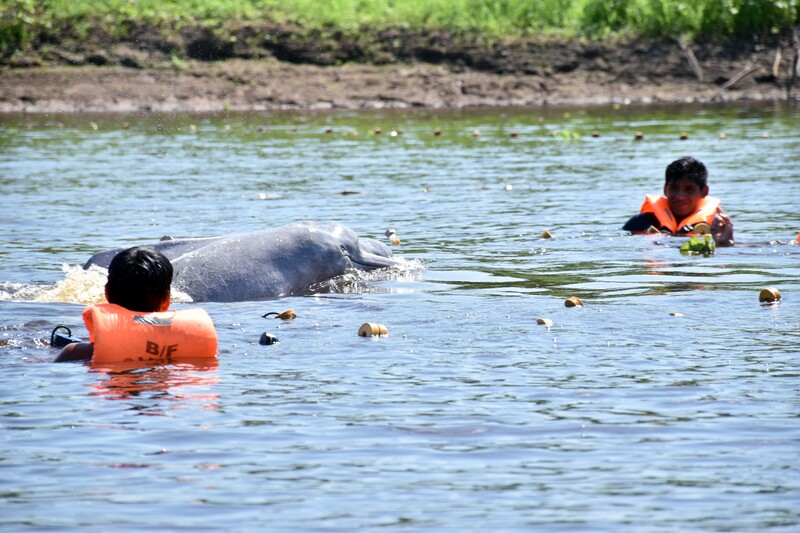 Therefore, to find out more, the first scientific expedition in Peru to install satellite transmitters on pink river dolphins was recently carried out. 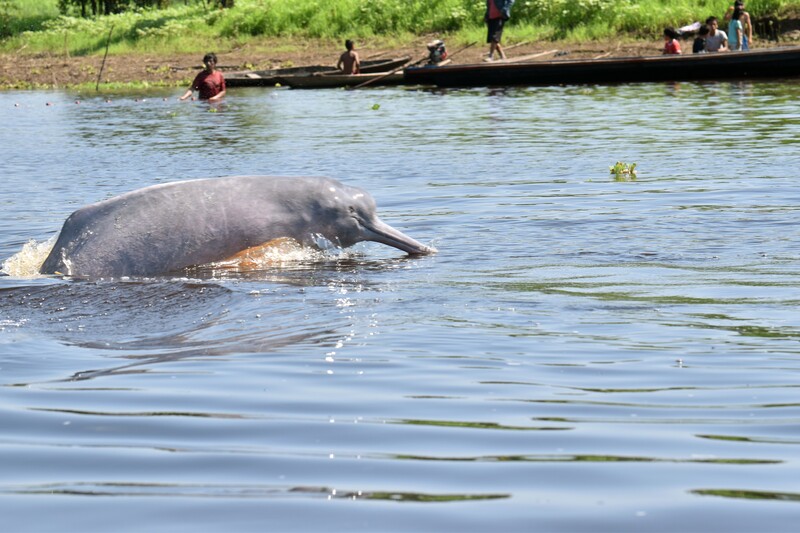 A team of biologists, vets and geographers went deep into the Pacaya Samiria National Reserve in Loreto (Peru’s northern Amazon), which boasts one of the highest densities of freshwater dolphins in the world. 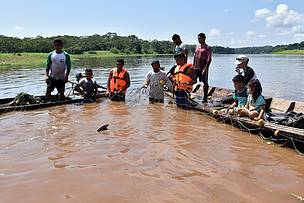 Together with members of the local 20 de Enero Community, the team led by WWF and its local partner ProDelphinus traveled along the Yanayacu Pucate river in pursuit of the pink river dolphin (Inia Geoffrensis). “After just a couple of hours, we were able to safely capture, study and place transmitters on three male and one female dolphins,” added Mena. 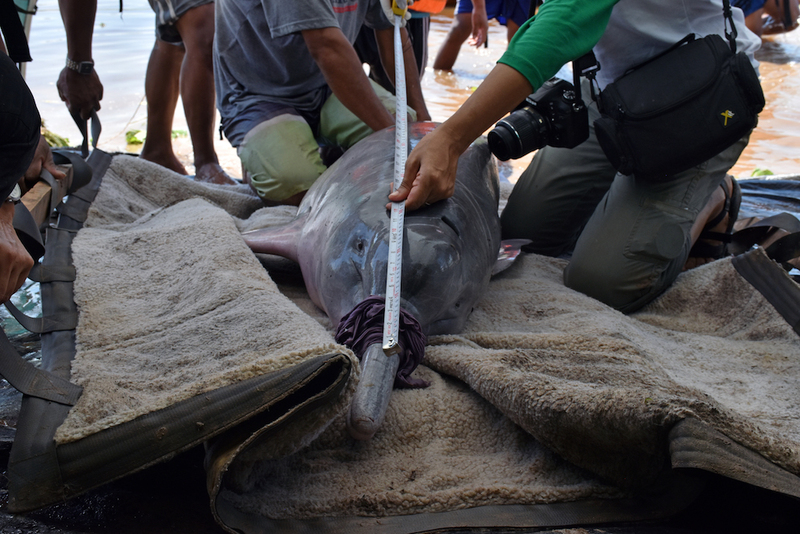 With a little patience and a lot of care, the local community members guided by scientists helped enclose dolphins with a fishing net and then lift them gently out of the water. Once done, the examination process began, including blood and tissue sampling that will provide information about their health and diet. Finally, transmitters were placed, and the data systematization began. “We follow a strict protocol that prioritizes the welfare of the animals and its quick release back into the water, with the least possible discomfort,” said Biologist Elizabeth Campbell, ProDelphinus Associate Researcher. “All the dolphins we tagged were safely released back into the river and we will now be able to see what they are doing on a daily basis, how they use their habitat, and even how climate change is impacting their home and behaviour." According to experts, dolphins monitoring not only addresses the urgent need to conserve this amazing species, but also provides vital information for the conservation of freshwater ecosystems. Dolphins travel long distances along large rivers and their tributaries. Thus, while learning about their behaviour, we can also get first-hand information about their habitat’s conditions, threats and conservation options. This information is particularly important nowadays when the Amazon river faces rampant pressures. 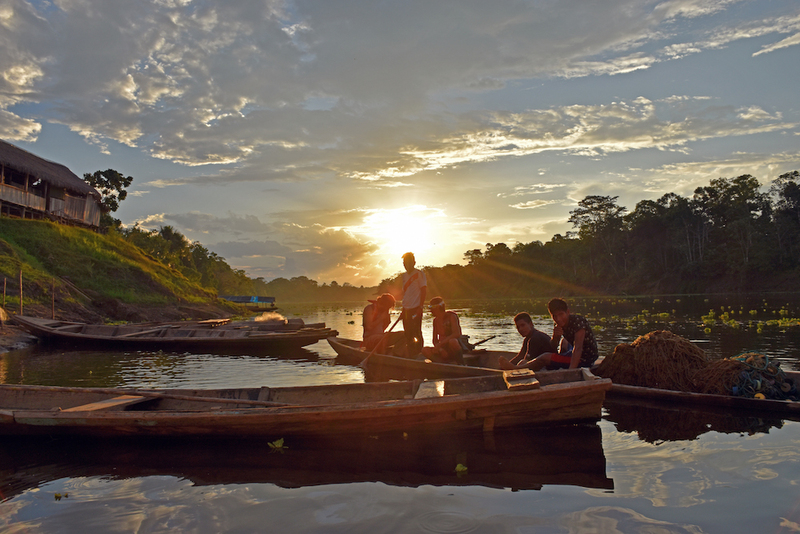 For instance, along the basins of the Huallaga and Marañon rivers (area of the ongoing dolphin’s study) several hydropower projects are planned. Moreover, the so-called Amazon Waterway aims to facilitate river transportation in around 2,500 km along the same two basins and through the Ucayali river, eventhough thorough technical studies about the potential impacts of its construction have not been conducted. Therefore, it is crucial to understand the dynamics, biodiversity and resources in these rivers to help ensure their long-term continuity and health. Dolphins monitoring is part of a comprehensive science and conservation strategy which WWF has been working on in recent years. “With the four dolphins tagged in Pacaya Samiria and another four in the Huallaga river, we will be able to compare how dolphins behave in a safe and healthy environment, such as a protected area (which is also one of the country’s first Ramsar sites), with another area suffering from human pressures,” said Mena. 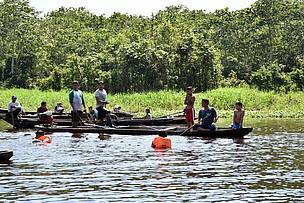 The expedition in Peru is part of a regional initiative led by WWF with local partners in Bolivia, Brazil, Colombia, Ecuador and Peru, which aims to tag 50 dolphins to design effective strategies that ensure healthy and free rivers throughout the entire Amazon. So far, almost 20 have been tagged across the region. The pink dolphin is the most iconic species of river dolphin. Other dolphin species and populations, particularly in Asia, are on the verge of extinction with just a few thousand - or in some cases less than 100 - individuals remaining. 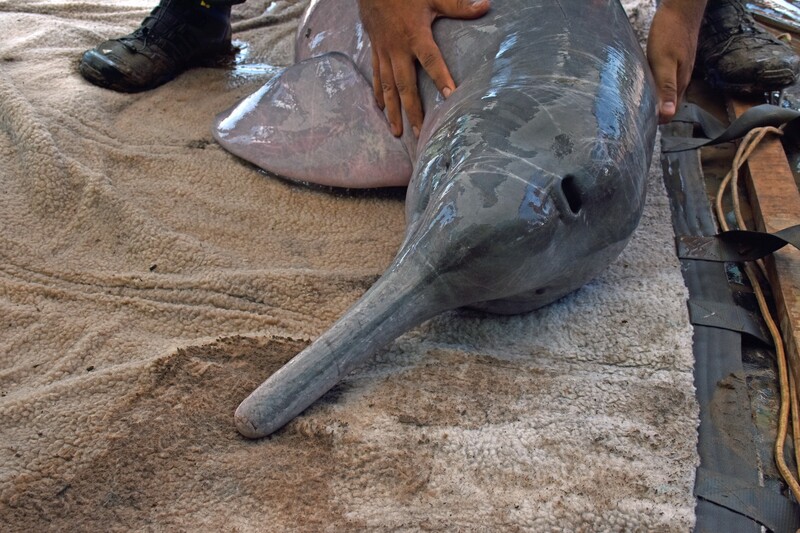 It is hoped that the historic tagging initiative in South America could also help efforts to save even more endangered river dolphin species around the world. A lack of data on movements and behaviour is one of the challenges with all the species, so this successful satellite tagging could provide WWF and partners in other regions with a new way to monitor dolphins. Nowadays, science provide us with better tools to foster these species survival. 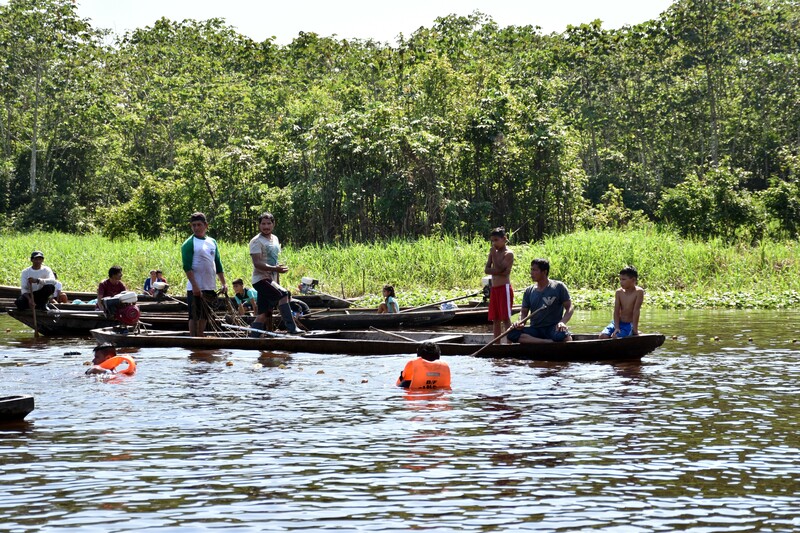 However, everyone must play its part – the private sector, authorities and local population – in order to ensure the iconic pink river dolphin survives to be an Ambassador of the Amazon.